An angler fishing a favorite stretch of stream might not think of it as being part of a larger watershed or basin. But that broader, landscape-scale vision is key to Trout Unlimited’s conservation strategy and success. Simply put, a river is greater than the sum of its parts. A river ecosystem is healthiest when it is integrated and whole, with mainstem, tributaries and floodplain connected, offering diverse habitat that serves a range of fish needs, from shelter to food. 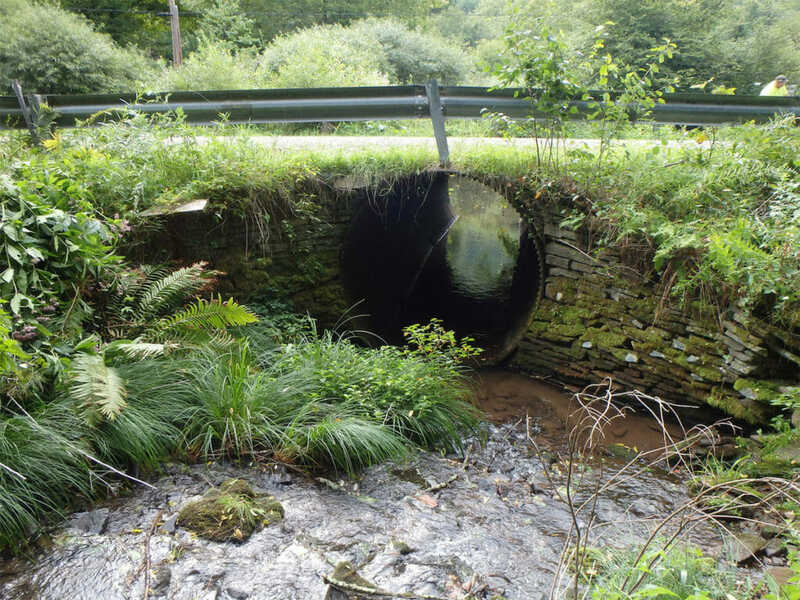 An undersized culvert prevents passage of fish and other important aquatic organisms. In many places, however, rivers and streams have become fragmented by migration barriers that block trout from reaching stretches that might provide better shelter, food or spawning opportunities. Those in-stream obstacles and bottlenecks, such as dams and perched and undersized culverts, can hinder trout populations throughout the watershed and prevent them from thriving. Many rivers and streams have also been disconnected from their flood plains, which limits nursery areas for young fish and prevents fish from getting out of harms way during floods. And when a river is healthy and connected, it’s more likely that anglers will connect with fish. It’s also more resilient to natural events, like fires and floods. The same stream crossing above, but with a new, much improved fish passage. That’s why reconnecting streams and improving fish passage is such an important part of TU’s conservation work. It also provides real bang for the conservation buck: A single removed barrier can deliver impressive benefits, improving fish passage for miles upstream and downstream. Reconnecting an oxbow or side channel can result in much higher juvenile fish survival, which means more adult fish to fish for. Fish aren’t the only beneficiaries of removing fish passage barriers and reconnecting floodplains. People benefit because connected rivers and streams protect human life and property by dissipating the destructive power of floods. Over the years, human activities, from agriculture to development, have created barriers in many river systems. The obstacles include diversion dams—ranging from aging concrete structures to “push-up” dams constructed each year from stream cobble and debris—that block fish passage and destroy in-stream habitat. Culverts often are too small to handle high flows, leading to road damage. Degradation of the stream bed on the lower ends of culverts can cause them to become perched, blocking aquatic species from moving upstream. Floodplain connectivity has been lost due to road and levee building, as well as residential, commercial and agricultural development. Dams also tend to warm a stream’s waters, particularly in cases where decades of siltation have created shallow, slow pools above the dams. 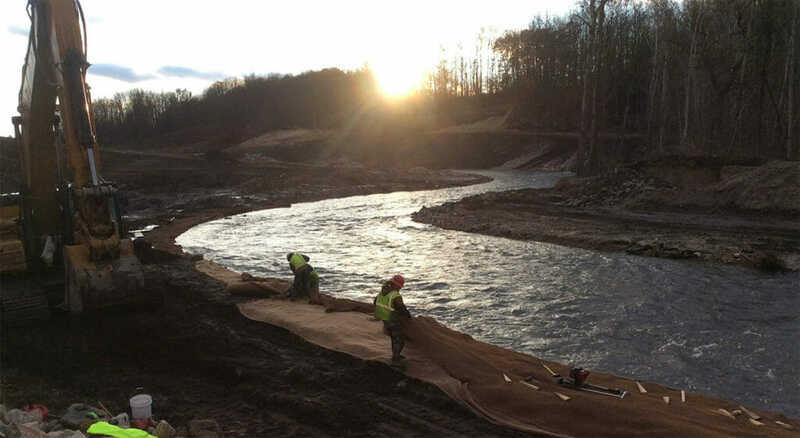 A crew works on a newly revealed streambed on Michigan’s Boardman River after the removal of the Boardman Dam. Often the fix involves removing or modifying a structure, for instance, installing a fish ladder on a diversion that allows fish to access upstream habitat or replacing an undersized or perched culvert with a bridge. Low flows—caused by irrigation diversions and drought—can also dewater a stretch to the point that it creates a barrier to fish passage. In that case, TU works with partners to find solutions, such as upgraded infrastructure and innovative water management, to ensure that enough water remains in-stream to keep trout populations alive and connected. TU invests in reconnect projects that offer the biggest returns, in terms of opening numbers of miles of habitat, improving high-value trout populations and providing flood resiliency benefits. For example, near Jackson, Wyoming, TU recently worked with local partners to remove an aging dam on Spread Creek, a key tributary of the Snake River and an important spawning and rearing area for Snake River cutthroat trout. By removing the obsolete dam, which was no longer needed for irrigation, TU was able to open up more than 50 miles of the upper reaches of Spread Creek for fish spawning and rearing. Nearby, TU followed up by removing a similar aging diversion structure on the Gros Ventre, another important Snake tributary, opening up some 100 miles of habitat. 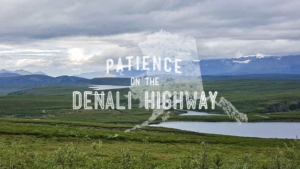 These reconnect projects are part of a larger strategy to strengthen the Snake system and help guarantee that fishing this legendary river remains awe-inspiring, far into the future. 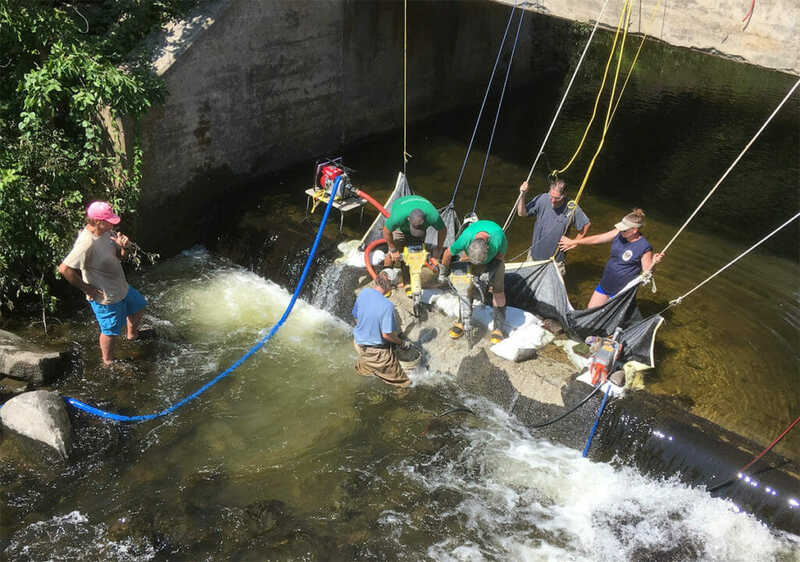 Notching a dam on Macedonia Brook in Connecticut has opened up an additional 2 miles of quality coldwater habitat for trout in the Housatonic River watershed. In the East, Trout Unlimited works with partners on dozens of culvert replacement and improvements annually. 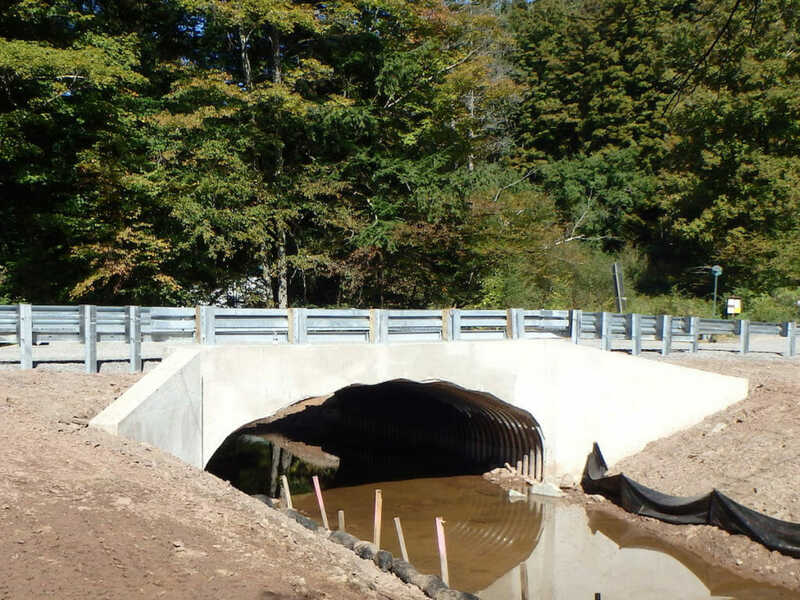 These projects not only often save localities money in the long run by reducing flood-related damage to infrastructure, they open miles of habitat to species such as native brook trout. An example is a recent dam-notching project on Connecticut’s Macedonia Brook, a tributary to the Housatonic River that can provide an important warm season refuge for the Housey’s resident trout. On a much larger scale, Trout Unlimited worked with a host of partners to remove and improve passage on dams within Maine’s Penobscot River system. All told, the years-long effort opened or enhanced access to more than 1,000 miles of river habitat within the watershed. Support the reconnection of streams and river. Let’s make fishing better.